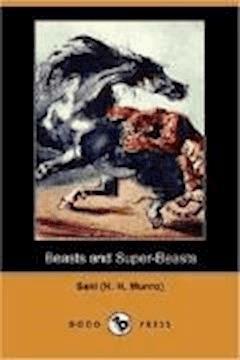 Beasts and Super-Beasts is a collection of short stories, written by Saki (the literary pseudonym of Hector Hugh Munro) and first published in 1914. Along with The Chronicles of Clovis, Beasts and Super-Beasts is one of Saki's best-known works. It was his final collection of stories before his death in World War I, and several of its stories, in particular "The Open Window" and "Sredni Vashtar", are reprinted frequently in anthologies. The majority of the volume's stories deal in one fashion with animals, providing the source for its title. The character of Clovis Sangrail, featured in earlier works by Saki, appears in several stories. Most of the stories appeared previously in periodicals. Stylistically, Beasts and Super-Beasts displays the simple language, cynicism and wry humor that characterize Saki's earlier literary output.